sambaXP 2018 – sponsored by Google, Microsoft and redhat – brought together the international Samba team again. People from all around the globe gathered in Goettingen and talked shop about current samba topics for several days. The annual success is an incentive for organiser SerNet to create another great SAMBA eXPerience in 2019. 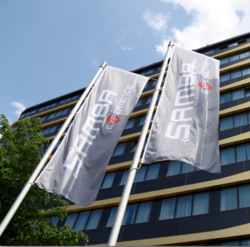 Therefore we are pleased to announce the date for sambaXP 2019 already: The conference will take place June 4-6, 2019 at Hotel Freizeit In in Goettingen. The Call for Papers for sambaXP 2019 has started as well. Talks should be submitted until February 28, 2019. The program committee will decide shortly after that and notifications of acceptance will be send out until March 8, 2019. SerNet and the Samba team are looking forward to submissions about SAMBA and the broader challenges of data management. Technical talks, user reports and presentations about future projects are welcome. The conference language is English, although proposals (in English) for talks in other languages will be considered gladly. Paper registration and paper submission can be done online only via the registration form on https://sambaxp.org. As for the sambaXP 2018: Slides and audio recordings are online now. All of them can be downloaded individually or as a package from the conference page https://sambaxp.org.